Every day from early morning until sunset, you can see a line of small dots out past the breakers in Oahu. Hawaiians invented surfing and those dots are surfers waiting for the perfect wave. Because the temperatures are always in the 70s or low 80s, they are out there all year long I am told. Since I live in the land of skiing, I have never tried surfing, have you? It looks like a lot of fun! Very pretty! 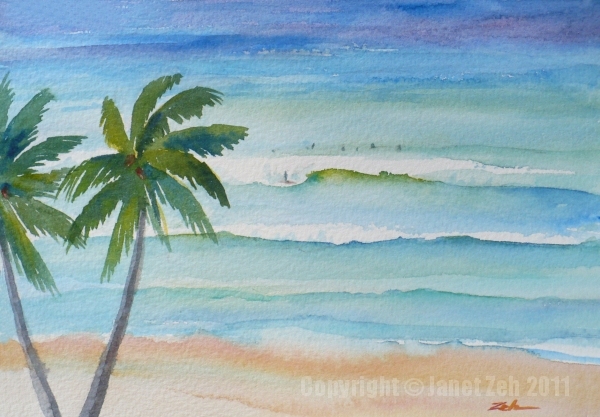 I found your blog while searching watercolor seascapes and saw both Hawaii and Delray Beach, one of my favorite places. People definitely do surf Waikiki all year, but after living on Oahu for a year and a half I think the always low 80s thing was made up by travel agents. If you average the night and day temps, it's probably somewhere around there, but there've been lots of days in the upper 80s and even 90s in the past few months and I'm tired of no A/C!